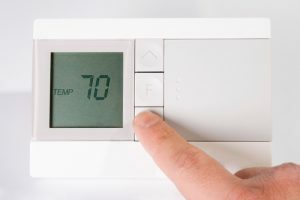 Thermostat Installation | Comfy Heating Air Conditioning Inc.
Is Your Thermostat the Cause of Your Cooling System Problem? If your air conditioner fails to cool your home as effectively as it used to, or if it’s costing more to run, your immediate thought is likely going to be that something has gone wrong with the system itself. You may be concerned about the cost of repairs—or worse, replacement. Before your mind shifts to panic mode, however, keep in mind that your thermostat might actually be the component causing the problem. Your thermostat serves as the brain for your HVAC system, meaning that it’s a very important component. Dealing with a malfunctioning, outdated, or failed thermostat is a lot easier to deal with than a failed condenser unit or compressor! Keep reading to learn how your thermostat may be the issue. Posted in Thermostats | Comments Off on Is Your Thermostat the Cause of Your Cooling System Problem?